Demi makes a come back? Words. They can make you smile, cry, angry, but they make up this world. Words have a huge impact on your life, and you may not even realize it. Recently I have been helping alot of people, through alot of things, and it made me stop for a second and realize. Words are all around us. We can’t help what other people are going to say, but in reality we can realize that all they are saying is words. Words were meant to make up the way speak, but not the way we treat each other. We shouldn’t abuse words, and hurt people with the things we’re saying, just because we have the words to use. Labeling people. This is one of my largest pet peeves. People label people, that they don’t even know. How do they do this? Using WORDS. Fat, ugly, stupid, so on and so forth. Theres nothing we can seem do about it, because its just the world we live in today. So, I guess your all probably thinking “What do these words, this post, anything have to do with me?” Well, this is a message I want everybody to know. I want EVERYBODY to know that when someone says something that hurts you, those are only words. Until that person has stepped a day in your shoes, they don’t have any idea. So, the next time someone tries to hurt you in that way, step up for yourself. Say, “Ya know what? Those words. Words can’t hurt me.” Because you are so much stronger than those words, and what they say? You best believe that they have no idea. They think they can out do you with what they say. But they can’t. It’s time we show everyone, that we are stronger than their words. Whose with me? You. Three letters, one word, so much meaning. How do YOU see yourself? Self confidence is key to a successful life, and if you don’t have self confidence, and high self esteem, your life wont be nearly as enjoyable. This post is to any girl or guy out there who thinks they aren’t good enough, to anyone who society has labeled, and who has been torn down by harsh words. Called names, made fun of, and to the point where life seems impossible. This one is for YOU. Ok. So you have been told you have no purpose, feel worthless, and are just so fed up your done with life. Don’t give up darlin, because your worth so much more than any of those people tearing you down. We have all judged people, thats the world we live in. A world where being yourself is ridiculed, and being unique is thrown away. Its wrong, very, very, very wrong. The society that we have judges based by your looks, by your skin color, the clothing you wear, and where you live. Girls these days feel forced to wear makeup, are insecure of the size of their body, and feel left out if they live the “single life.” Guys are being told they are weak, ugly, and are bullied on a regular bases. Girls and Guys commit suicide on a daily bases, and all we do is sit back and watch. How many people have to die before this ends? So, I have a message for all of you who are being told these things, and who feel like nothing. You all have worth. You are all unique in your own way, and the words they say? They arent true. You deserve better. Some day you’re going to get that better, and you’re going to have a good life. I know it feels like you cant go on, but dont give up now. Because you are all worth something. Nobody, and I mean NOBODY can take away your worth. God created you to be you, not to try and be somebody your not. You are absolutely perfect in his eyes, and if you throw away your life now, that’s just proving to those people that you believe them. That you believe that you are fat, ugly, and worthless. Well trust me darlin, you are most certainly NOT worthless, or any of those words for that matter. You are more precious than any diamond, gold, or any amount of money on this earth. You are PRICELESS. Revamp for the new year? I know what your all thinking, as I have thought it myself; “Where the heck has this blog gone?” Its been a busy past few months, and my life has sort of been all of the place. No dramatization there. I want to revamp my blog. I want it to be a place people want to come, and were I can just let all of my feelings on topics out. So yeah, not as much farming, but not complete indie hipster either. Is there a nice in between? I love all you guys, and you have all supported me so much through the past, so I want to give you all a blog you can love as much as I love you all! I don’t want to sound all emotional and ridiculous, because honestly? I just want y’all to share my blog, enjoy my blog, and have a nice day. Let me know in the comments, and on my Facebook page, what y’all would like to see more of on my blog. This way I can make it the best it can possibly be. Thanks ahead of time for all the support, and feedback, I truly appreciate it! So, as life on the farm carries on I realize my lack of posting. In the interest to keep all my blog followers, and soon to be followers entertained I will try to post at least once a week(hopefully more)! So, hold on tight and check back to my blog daily for more fun stuff! That’s all for now my friends, make sure to leave me comments letting me know what you would like to see more of in the future. And make sure to look at the other pages on my blog, for more updates! Also, leave comments for my bff on her blog! One other thing before I sign off. Please let me know on the Facebook page or in the comments what you would like to see more of on my blog. Polls? More Music? Different pages? Let me know! As promised in the former blog, I will tell you about family Christmas traditions and how I celebrate! Also tell you all about some improvements to the blog! Lets get started by talking about the Holidays! Every Christmas there is much to be celebrated. After Thanksgiving we put up all of our lights, decor, and break out the Christmas music! Before we know it, its Christmas eve. We go to my Uncles church and afterwords we eat a wonderful dinner! When dinner, games, and talking are over for the evening we go to the nativity scene in Columbus. It has always been a tradition of my family’s, and it is super fun! When Christmas day rolls around we get up really early! Usually at least 6AM! It adds more excitement to the day to get up early. We turn on all the Christmas lights and us kids wake up the parents. We open all the gifts and before you know it my other sister and her husband are hear! We do gifts with them, and wait until later when all the rest of the relatives come. We eat dinner, open gifts, play games, and laugh alot! At the end of the day when everyone goes home, we think of how the day went and how much fun we had! Music: This page is were you will find all things music. From new covers of songs, my favorite songs, polls, and a place to express your music views! Books: This page will tell you all about the books I have read, am reading, book reviews, and creates a place for you to talk about your recent finds in the book world. DIY crafts: You will find craft ideas, and things that are sper simple for you to make! Recipes: You will find recipes from different time periods, my favorite food/recipes, and you can even share your recipes! I will hopefully have a post a week in each on (or at least 2) their specific topic. So, make sure to check back to each page daily! And don’t forget to share my blog with all your friends! An up and coming Christmas and an oppertunity for you! and the best for last….Grand Champion Continental at the Ohio National Poultry show!! Woot woot! Now those were just some, and only mine! My sister did very well this year too! 1st in showmanship’s, grand champion large fowl, etc…Now that I have gone over that, it’s time to talk about the up and coming! It is nearly Christmas (just 16 days!)! I can hardly believe how the year has flown by and that it is nearly 2013. It seems that just yesterday we were all gathered around the Christmas tree laughing and opening gifts. Now I want to do something a little different for this post. Rather than me just talking about what my family does for Christmas, I want to here about you! Let me know how you celebrate your Christmas or any other holiday you celebrate in the comments below! The more comments the better! After you all have told me about what you are doing, I will write another post about how my family celebrates. So go ahead, type away! As some may know I just read an amazing book written my friend Madison Louise.She decided to have an awesome blog tour so that people like me could interview some of the characters from the book! So, here we go! First I want to tell you a little about the book! Pearl Underwood is an overshadower, she has been her whole life. Overshadowers control the shadows, and they don’t like the undimmed who control the light. Through out this book Pearl faces challenges about her future, through pressures of getting fastened (married), to falling for a great guy at public school. This is a pretty fast read novel at about 284 pages with each page being full of adventure that keeps you guessing. If you are looking for a magical, adventure filled, romance, that you can’t seem to put down this is the book for you! And now…Drum roll please…My interview with the one and only Josh!!! Shadow Future interview With Josh. Hi Josh, it’s great to be able to interview you today! How are you doing? Last time I “saw” you it wasn’t going so good…. Josh: Eh, not really, Cassady. But, hopefully, I’ll be better soon. So, do you think of Pearl more of a friend, sister, or crush? Where does your shyness come from? Josh: I think it’s mostly from being around Zeke. He’s so loud and talkative, and he does most of the talking anyway, so that I don’t have to say anything. Also, being in the background is cool too. What is it like to be an Overshadowder? Josh: If Zeke wasn’t here, it would be pretty boring. We never get to do anything but study, and play video games. But for Zeke, that’s fun. But for me, it isn’t. But I guess I enjoy spending time with my ‘family’. The one thing I hate the most is: being told that I am a guy, and that girls are below me. It just doesn’t seem fair to me. But that’s just life I guess. How do you feel about the whole idea of getting fastened one day? Josh: I’m not really sure. At the moment, it’s just Pearl, so…I’m not really sure who I would get to be with anyway. Would you ever consider being an undimmed? Josh: It’s not actually possible to change. But I think it might be cool for awhile. Since I’ve never liked light, it would be a huge change to suddenly want it, and the darkness driving you crazy. Now for some fun questions! What is your favorite food? Josh: Hmm…let’s see…does ice cream count? I would say ice cream defiantly does!! Favorite color? I know we all want to know. What is your favorite video game? Well, to finish our interview one more question! Could you give us a sneak preview of your next adventure? Josh: You’re welcome! I enjoyed being here. 🙂 Thanks for having me! Well, that was my amazing interview with Josh. Now there are a couple more things I need to tell you about. There is an AWESOME giveaway going on RIGHT NOW and YOU can be part of it! Because I have wordpress I am going to send you to Madison’s blog. There you will be able to find a RaffleCopter giveaway “box”. There are a few different things you have to do to be entered for great prizes. One of the things they ask for is a “code word” which I will give you right now. It is: Let Someone. If you continue to go to the different blogs you will be able to enter everyday with a different code word. Finally, I would like to thank Madison Louise for letting me be part of this great blog tour! I am so glad that I got the opportunity to do it. Another thank you to her though for just making the book, it really is a good book! I encourage all of you to read it! Hello, and thanks for visiting my blog! It is a beautiful day here on our hill top farm. The sun is shining and the goats are all out grazing. My lack of posts (as you may be wondering) has simply just been that I have been very busy. It seems that as soon as the sun starts shining we get super busy! So, to tell you about my past weekend, I decided to sum it up with a few pictures (everyone loves pictures..Right?) ;). Saturday I got up at an early 6:50AM. That morning we had to get to the fairgrounds for a Poultry clinic/Quality assurance for our county. As soon as that was over we headed home. After a quick lunch we packed up our 2 sheep and headed to our friends house. 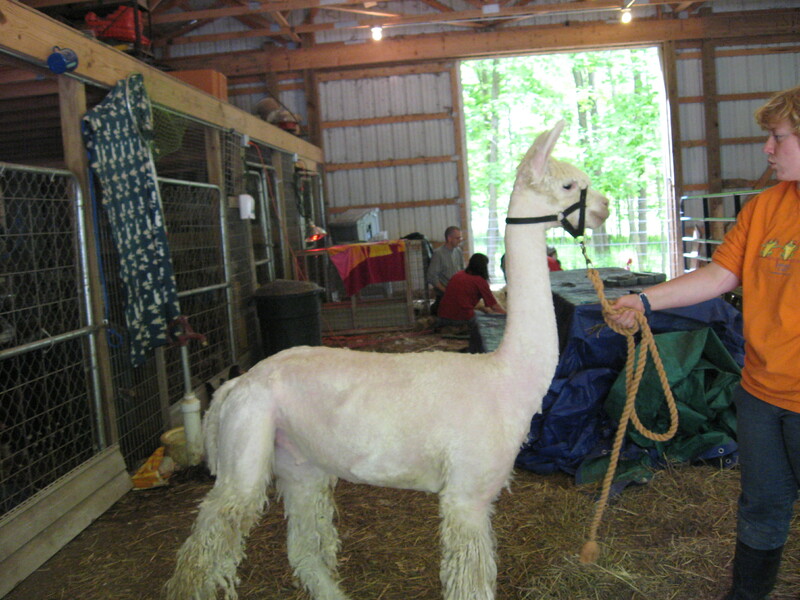 It was shearing day! 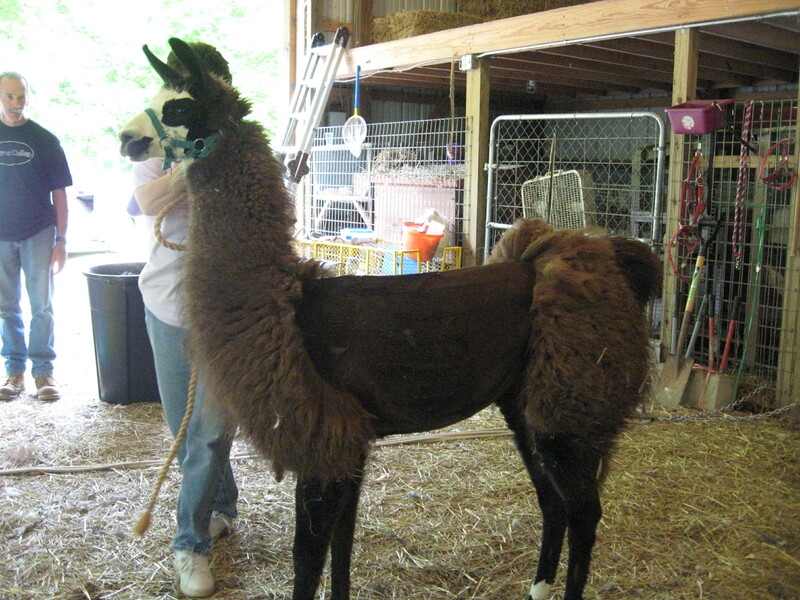 The night before (Friday) we had brought over our 2 alpacas and 1 llama. 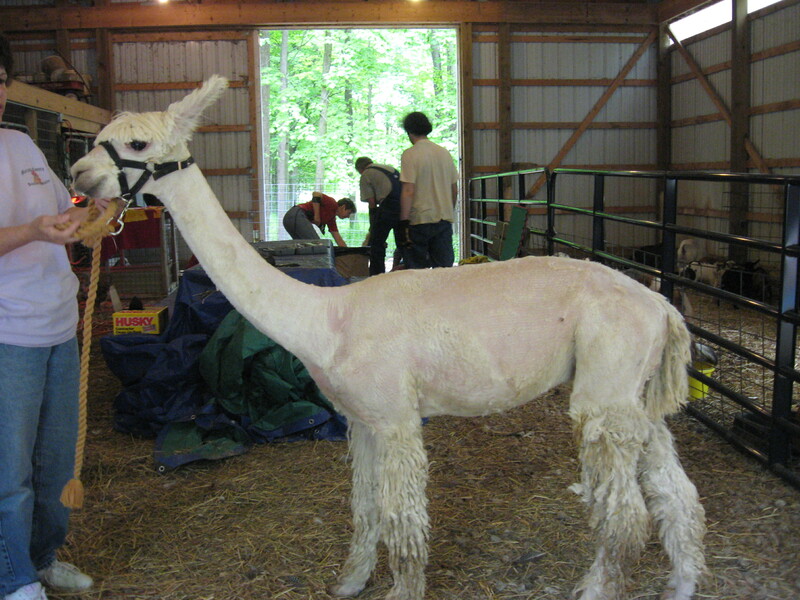 All in all counting the other 2 family’s there were 17 llamas/alpacas and 2 sheep, to get sheared. We spent the rest of the day shearing (well…Not us shearing. There were professionals for that). We had to have been there about 5 hours or so (yes, I slept good that night). The next day was Mothers day. We went out for breakfast and then went shopping. We spent a while just hanging out at home. Then Dad, my sister, and I went to the store. We bought all the supplies we needed and made Mom dinner. All in all it was a pretty good weekend. So, why the name for this post? Almost all know that chicks go “cheep”! And our farm has been in full swing with hatching chicks. I believe we are on our 4th hatch of the season. Now, you’re probably thinking “you really need that many chickens?” Well, we can always use new layers, but our hatch rates have not been that great. But as my mom would say, it is almost addictive hatching chicks. It is fascinating to one day pick up an egg and 21 days later have a living, breathing, chick! Along with hatching we have 48 broilers. The broilers we will sell to customers at my father’s job. I hope y’all are doing great!